I thought it might be. Vidarh's lopsided smile looked rather half-hearted, I realize it was not the most dignified way for a guest to arrive, I rather expected to have to explain it to your brother. She allowed her own faint smile, it was just as well she had shielded her thoughts of a moment ago, Vidarh was very perceptive. Gullin has a great deal on his mind at the moment and is probably more polite than I am, I'm just curious. Forgive me if it sounds like I'm prying. I mean...teleportation? Levitation is one thing, but not many people can actually teleport. I didn't know I could, myself, until recently, I used to do short 'hops' as a boy and thought it was something everyone did. It was only when I realized the other children of my age didn't teleport that I began to think there was something wrong with me and stopped doing it. Vidarh paused, looking at her with eyes that did not lose their sparkle, although a shadow crossed his face. I hate to ask for votes again - and thank you if you voted in the first round. I'm thrilled to say that the cover of Beloved Enemy by WRP cover artist Rae Monet, is a semi finalist and if you could possibly give it another quick vote I would be hugely grateful. Thanks so much in advance, I really appreciate all your support! arrive. To become stronger she must restart her divine journey by reincarnating as Bridget Blade. But what if Bridget doesn’t want to be a god? powers and impulses she struggles to control. Bridget must choose a path that leads her to Nouei or, must force the Queen to settle for Bridget’s modest ambitions. Bridget’s part in all the events was a carefully guarded secret. The Order knew. The French, U.S., and Chinese governments all knew enough, as did the Vatican. Many people were present when Bridget was rescued from an electromagnetic field that she likely generated, and also when she appeared to emit ionizing radiation from her body. She was too much of an oddity to keep a secret forever, although most of the people present had been discreet about the information so far—most, but clearly not all. woman and has four amazing kids. He is interested in religion, politics, science fiction, writing, food, mathematics, and other things. There are so many lovely covers in this contest and I'd really love to get an award for my lovely cover artist! 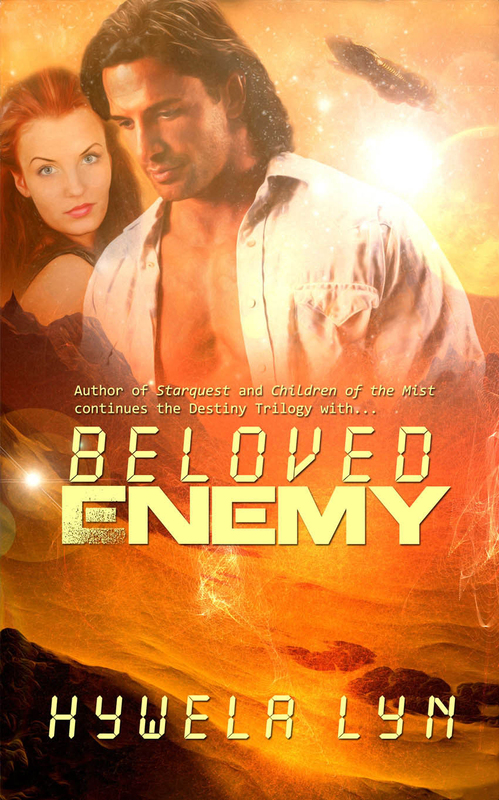 Thank you so much to everyone who voted for the cover of BELOVED ENEMY, the third book in the Destiny series. I really, really appreciate your support. I'm currently sharing excerpts from Children Of The Mist the second book. For those who aren't familiar with my excerpts, this story is set on Niflheim, a planet close to the heart of Jess, who features in the first book, whose inhabitants are telepathic. The heroine is one of her closest friends, Tamarith.Tamarith is currently nursing a broken heart, but since Vidarh is a guest in her house she can hardly avoid talking to him can she? This week's snippet takes place on the day following his arrival. Well fed and rested, he goes outside into the morning sunshine and spots Tamarith. She sensed his mind discreetly touch hers and realized he was staring at her keenly. She turned back to face him, returning his questioning glance and studying him in turn. Taller than average, and broad-shouldered, today he wore a sleeveless, belted leather shirt over thick breeches, with long, icecat-wool lined boots. His upper arms were well muscled, his skin tanned as if he were used to working outdoors. His curly, dark auburn hair, kept away from his face with a plain leather band, reached almost to his shoulders, it caught the sun's rays and gleamed like the polished dark red wood of the trees that flanked the feet of the mountains. She took in his clear, hazel eyes, with their friendly twinkle, strong jaw line and smiling mouth. He would have been fighting off the local unattached young women if the situation they found themselves in were not so serious. Not that she was particularly interested in his looks, or those of any other man, for that matter. No, something else about Vidarh of Ragnak excited her curiosity. 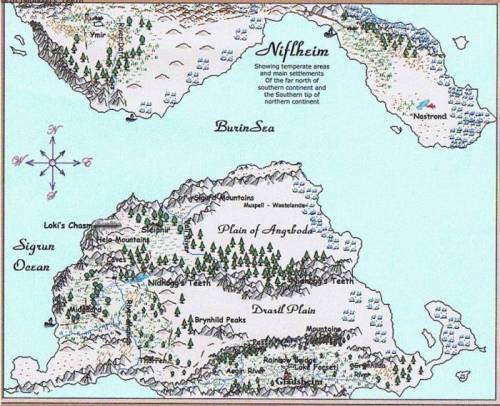 I'm no cartographer but here's a map I made for Children Of The Mist. It was a great aid in keeping track of who journeyed where!